The ABC’s of Yoga for Kids, by Teresa Anne Power Illustrated by Kathleen Rietz. As many of you know I am a 200 hour certified yoga instructor. While I do, on occasion, teach adult classes I mainly use my teaching knowledge for the kids that attend my daycare. I am always trying to think of new ways to communicate the different yoga postures and experiment with the different one’s the kids are able to do without injury or pushing them past their skills. I found this book which not only exposes the kids to different postures but offers the added learning lesson of the ABC’s. Anytime you combine two lessons into one I feel you offer more opportunity to the kids who will start life multitasking. I love yoga! Found a great blog about it! I love yoga! When I first got pregnant with my first child 2 years ago I was at about 175lbs down from the 200 I had gotten to a year previous. I had done this by hiking all the time, doing work out video's when it rained, walking on my lunch breaks, getting up early to train my asthmatic lungs how to deal with a run( also had to train the dog), and my husband was starting to do weight training with me. When you're not pregnant it's easy to do those things. So, today is the day my guest blog will be visible at Cookies Chronicles! Please make sure to check it out as I expand my blogging experiences and writing ventures! To see my posting just Click Here. Thanks to all my readers and followers for supporting me and I hope to continue to provide my own thoughts to spark yours, crafts for moments with your kids, and lessons learned to help you during yours! A specail Thanks to Cookie's Chronicle's for this opportunity and for sharing your veiwers with me! You can find Cookie's Chronicles by clicking on the button attached here or by clicking on her button on my Button Collection Page. Sometimes cupcakes sound just boring! Recently, for one of the daycare kids’ birthday we decided to have some fun with cupcakes! The kids got involved, a mess was made, and they unwittingly worked at sharing/measuring/hand-eye coordination/basically a ton of skills working out both sides of the developing brain. In the end, we had fun and some yummy tastiness! Start by having the kids sit at a table. Each kid gets assigned a different ingredient from the cake box based on difficulty and skill. They all get to put their ingredient in and stir the mix. Some with splash some will drop some and some will try to stick a hand in the bowl. In these moments remember everything wipes up even kids! Show the kids how to level off a scoop or break an egg (maybe in another bowl depending on the skill of the child). Ask them what they notice about the mix after each ingredient, is it hard to stir, is it liquid, is it changing color, and write down what they say in your kids journal! Once everything is mixed, have a kid put the cupcake papers in the cupcake pan. Maybe have the older kids help put the batter in the cupcake papers. Then, while you put the food in the oven talk about how this is a parent job and explain that the oven is hot along with the dangers of a hot anything. Follow the box for how long to cook the cupcakes. Allow the cupcakes to cool after baking. During this time have each kid help clean up, swiffer is awesome because it can be made kid size by simple taking off the top of the handle, wiping the table is a favorite, rinsing tools, putting them in the dishwasher, putting away ingredients, are all things that kids can do with guidance and help! (The older kids can help with this next part while the younger ones nap.) After the cupcakes have cooled unwrap them from the papers. Cut each cupcake in the middle. Add some Oreo frosting to the one side of the split cupcake and put the other half of the cupcake on top. Viola! You have a Giant Oreo Cupcake!!!! Simple, easy, yet fun and a different flare to a cupcake! Here is the best part! Everyone gets to eat their final product!!!! Again, kids will wipe off, but their smiles will be left behind. I would like to warn that as this is full of sugar, calories, and other bad for you things I'd rather not think about at this time it’s probably best for everyone to only have one (including us adults) or we will pay for it later! To close, a little bit of indulgence is a great recipe for a job well done. Like any recipe too much of any ingredient will ruin it, too little and it will be ruined as well, moderation and imagination are the key to the recipe of indulgence! Now, for a warning and the second half of this blog: To those with dogs, I warn you now as apparently cupcake Oreo’s may cause horrible behavior in dogs including climbing onto the counter to retrieve them for themselves and doggy buddies while you sleep. I have made cupcakes before and never had a problem, but for some reason one of my dogs decided these were too good to resist and I caught him and one of his brothers chowing down! Knowing the dangers of chocolate to dogs I immediately woke the hubby and called the vet who directed us to poison control. I was informed to have the dogs vomit, don't feed until dinner, and watch for diarrhea which would warrant a trip to the vet. To make the dogs vomit I gave a 55lbs dog a teaspoon of peroxide, it works fast and efficient. Yeah Me! What a fun mess to clean up! To make your life easier here is a link to order peroxide, amazing for so many things! My dog in expelling the mess learned a hard lesson and is back to not attacking counters. My lesson is that no matter how much we prepare something can still happen. My second lesson is that no matter how trained or behaved a dog or kid is their will be moments and things in life that are too tempting and discipline is needed. Excuses can't be made, I should have put these on top of the cabinets which are higher than the fridge for true safety and I will remember that manners in dogs and kids always need to be reinforced and re-taught to ensure they are followed! Also, if your dog ever eats anything your not sure of always call a vet or poison control! Do not ever give your dog peroxide without finding out how much is alright for their breed, weight, and general health. Lastly, learn from my lesson and know that no matter the training or size dogs are still dogs and can try to climb counters for something taste. Live, love, and belly rubs to our fur-babies! I was awarded my 2nd Versatile Blogger Award last Thursday from my most recent follower Marvels of Motherhood! Thank you so much for the award and for enjoying my blog! Marvels is an amazing blogger in her own right and I love that she not only shares her personal experiences with us but offers links to cool kid tools she has found like links for iphone books for kids! Thank you so much for the recognition and keep on blogging! Here is a link to her blog and the Versatile Blogger Awards she distributed! Touched by a kid card! Birthdays, Birthdays, Birthdays become a major event in your child’s life. I’m not just talking about their own either, they will have family, daycare friends, school/preschool friends, church(if you go) friends, activity (soccer, swim, dance, football, or whatever else you sign them up for, and mommy group friends Birthdays to go to each month. So, how do you teach your kid to make each gift special? Start with the card! While, the King/Queen is making the crown each kid gets to make a card!Yesterday, we made crowns for the King or Queen of the day. During that craft while we had the King/Queen decorating their crown we had the other kids doing something else. Start by having you child decorate the paper. Measure the middle of the paper and with a faint line in pencil mark the center where the fold will be. Advise the child not to glue anything on the line, markers, crayon, color pencil are fine, but no gluing or the glued object will fall off. Tell them what the card is for and who they are making it for. 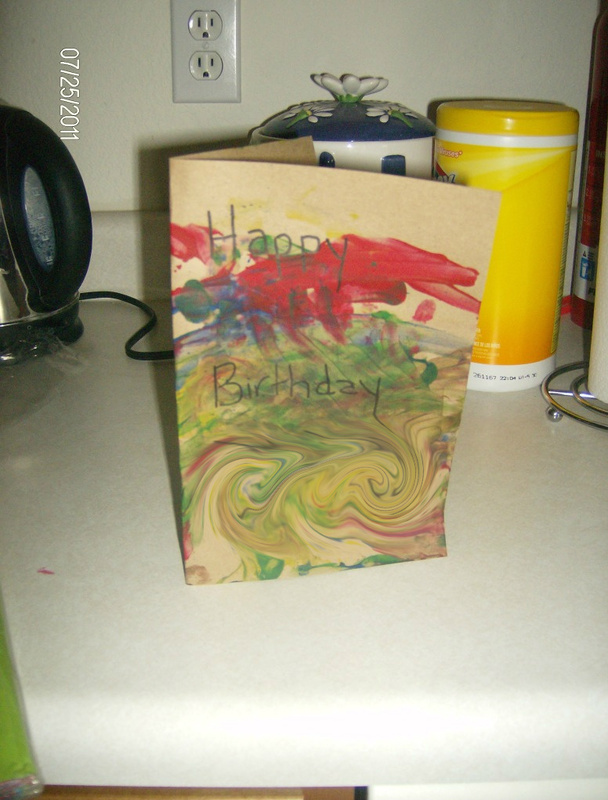 Ask them what they think the other person would like on the card, it may change the colors your child is using or their design suddenly becomes different than something they would have done in the past. Once the paper is decorated allow it to dry if needed. After it dries fold the paper in half. On the back side of the card write “created by (insert child’s name). If the kid is old enough with enough vocabulary ask them what they want the card to say and either have them write it or have them sign the inside themselves. If the child isn’t old enough just create a snappy saying for the card and have the card creator put a hand print for a signature on the inside. Your child has now not only explored their artistic side, but worked on letters, sentence forming, consideration of others, peer analysis, and putting a little heart into a gift. Make sure you write down anything the child tells you while they work on this and take note of any crafty phrases they choose for the card! Kids are always observing and it may surprise you how much they have noticed about their friends and what their friend would enjoy seeing on a card. To close, it never hurts to put a little heart in anything and a little heart added to a gift doesn’t cost a thing, but adds millions to the value! Every kid loves their birthday and wants to feel special. Why not have a queen or king for the day? No Spoiled Princes or Princesses in my house, only Kings and Queens who aren’t spoiled and rule their little worlds with diplomatic tendencies and respectful demeanors. We offer the top of the food chain only for these kids on their special day. Each kid will have their special day where they get to pick between this or that (both favorites) for lunch or dinner, pick the book for story, pick the movie, pick outside play or inside stretches, etc. It is their day of guided choice. They get to feel special and celebrated plus explore their preferences with each choice. Now, what does each king or queen need? A crown of course! Who better to design the perfect crown than the kid themselves? The other kids can be busy painting a piece of paper (to be used in a future posting), while the king or queen get to decorate their crown with markers, jewels, stickers, and whatever else you have and they want to put on it. First, cut a strip out of the Poster board depending on how tall you want the crown to be once on, remember if it’s too tall it may look like a dunce cap or just fall off. Now, just set the markers, scraps, and glue in front of the little royalty! If they ask for paint, why not, add a paint shirt to the kid and your set. Once they have decorated the poster board till they see fit allow it to dry. Cut a wavy design out of the top, measure the kids head and staple the poster board to fit making sure to overlap the ends of the poster board for a sturdier crown. If you wish to add their name, do so in fabric, jewels, marker, or whatever you (or the child) choose. Place the crown on its owners head and you’ve just crowned your King/Queen of the day! Write down the preferences, choices, decisions and their reasons in your Kid’s Journal! Ask them why they pick what they do each time to get them thinking of cause, effect, and develop reasoning skills. Don’t be worried if at first they aren’t sure of why, just asking for an answer can get kids thinking about something they may not have been. To close, it is important for us all to remember that we are not always the ones in charge and we need to respect and listen to those around us. That said it is not healthy to never be in charge of anything, if you do not place responsibility and authority on yourself in your life you will end up leading someone else’s to a lesser extent. So, when its someone else’s turn to decide, allow them the respect you want back and when it’s your turn to play King or Queen always make sure to accept responsibility for the choices you make.